Genius Pandora Mini Game Pad, USB, Turbo Function Key, High Precision 8-way D-pad, 8-function buttons include 2 triggers, 1 year warranty Copyright © 2019 ComXpert International CC - COPYING IS ONLY ALLOWED FOR THE PURPOSE OF SENDING US ENQUIRIES. E&OE. Genius maxfire pandora game pad is designed for the gamer on the go. Its compact size is reminiscent of classic game pads. But this one has been updated for today's gamers. The d-pad on the left is complimented by six action buttons on the right. There are also two shoulder triggers. Perhaps the best feature for the mobile gamer is the compartment on the bottom that holds the usb cable when you aren't playing. Usb cable stores under game pad to eliminate tangled cords and is easy to carry. Use the turbo function for auto repeat and turbo power. Compact design for notebook users or kids. The best price and guaranteed service and backup from official computer suppliers in South Africa for the MUL220 Genius MUL220 MaxFire Pandora Mini Game Pad. The Genius MUL220 Genius MUL220 MaxFire Pandora Mini Game Pad is available for R135. The product is sold by ComX Computers as new. Prices are valid today 2019-04-22 (before 2019-04-23 , by quote, while stocks last). The product is expected to be in stock, although this is not guaranteed. Find related MUL220 Genius MUL220 MaxFire Pandora Mini Game Pad products in our Game hardware Category for even more options. 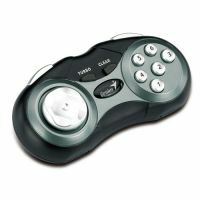 Read reviews and find out about MUL220 Genius MUL220 MaxFire Pandora Mini Game Pad. Discounts, specials and cheap prices only at ComX Computers.